Note From Pete: This is a guest review by Tyler Mathews. Tyler is a runner from Austin, TX, and a fellow member of Team Wicked Bonkproof. He is currently training for his first marathon, and is logging 70+ miles per week. To learn more about Tyler, check out his blog Running Toward Dreams. I wear a lot of running shoes. Some of them are considered more minimal, some more traditional, and I believe that using varying shoe types is critical to my training. In the same way that your body needs recovery days between hard workouts, I believe that my feet, legs, and core need a recovery day on days between runs in more minimal shoes. This is why I continue to use more traditional style shoes in my training – the Saucony Ride 6 would fit in this category. I received the new Ride 6 after having done many miles in the earlier Ride 5 (Disclosure: these shoes were review samples provided free of charge by Runningshoes.com). The first thing I noticed was the upgraded aesthetics on this model. The shoe is sleek, shiny, and has a great colorway which I don’t find myself having to apologize for, as I did with the Ride 5 (got my 5’s in an ugly colorway on clearance). The profile of the shoe is largely unchanged from the previous version. The outsole, though a bit different in construction, even maintained the mini triangle design. The upper mesh appears to be more breathable on the newer model, which may reduce its durability as the shoe gets older. The Ride 6 is a shoe that has many of the properties you’ll find in a traditional lightweight neutral trainer. It weighs in at 9.6 oz in men’s size 9, with an 8mm drop (28mm heel, 20mm forefoot). Saucony differs from a lot of other manufacturers in having moved all of their traditional shoes to 8mm drop (most traditional trainers are 10-12mm drop), so keep that in mind if you are considering this shoe. It has almost no flexibility in the forefoot, very little torsional flexibilty in the midfoot (it’s not easy to twist the forefoot relative to the heel), and a lot of heel cushioning. I did notice that the cushion on the outer edge of the heel seemed to be much more solid than that of the Ride 5. 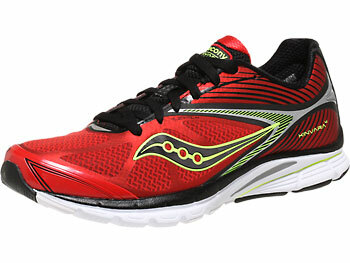 This shoe was clearly designed to be a high mileage trainer, as the outsole has very little exposed foam and is mostly covered by fairly thick rubber, something that is quite contrary to a shoe like the Saucony Kinvara. This has the added benefit of increased durability, but may cause the shoe to feel a bit stiff at first, as rubber takes longer to break in than foam. I first took these shoes out for a Friday morning easy run and felt no foreign sensations when slipping them on. They didn’t feel overly different from the Ride 5, no dramatic changes in fit, motion, or cushion. This might sound boring, but when you put in between 70 and 80 miles a week and are 2 months out from your first marathon, you tend to look for a certain level of continuity, a shoe to welcome you home with a hot cup of coffee and some oatmeal chocolate chip cookies. Can you tell it’s almost Christmas? I did feel the normal tingly numbness in my forefoot, something that I’ve learned to be unconcerned about in a new pair of shoes. I get these tinglies every time I put on a new shoe, between Skechers, Saucony, Brooks, Adidas, whatever. I don’t know why it happens, but it goes away after I put a few miles in. Now this next bit is to work on the feels of you minimalist types who think that traditional shoes kill your form. They don’t. Bad form kills your form, and you can run with good form in a more traditional style training shoe. While wearing these Ride 6s I still managed to land around my midfoot and my form felt smooth. I had no premature heel contact which would cause any rolling, and I also didn’t feel overly coddled. My feet felt cushioned and comfortable. Something I’ve noticed lately in a more minimal shoe is that I have become somewhat susceptible to some minor tweaks from the extra flexibility which occasionally causes some discomfort in different areas of my foot. The Saucony Ride 6 helped me to recover from those by keeping my foot in a solid position without risk of weird twists and turns. I took these shoes out for an 18 mile long run yesterday, and followed that up with a 7 mile run with some middle school kids (see Marathon High). I had expected to feel some soreness in my feet and legs after 25 miles and over 3 hours on the road, but I felt pleasantly fresh, beyond just feeling zapped from all the calories burnt. These are definitely some shoes that I will continue to go to for these easier, longer, slower miles. These trainers are an excellent choice for people who are looking for a traditional, high mileage, neutral trainer without too much motion control and a modest heel. When I just want to run some miles without thinking too much about my footwear, these will be one of my go-to pairs. 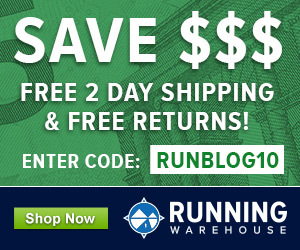 The Saucony Ride 6 is available for purchase at Runningshoes.com. Great review. I had tried the Ride 6 for a couple of weeks back in September, before moving to the Kinvara 4. This was after running in the Virrata for several months and the Mizuno Cursoris before that. 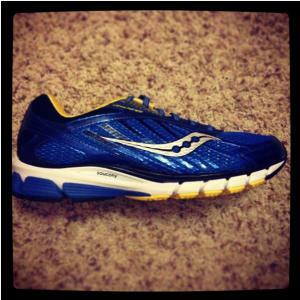 I ran in the Kinvara 3 most of last year. I had to move up from zero drop as I could never get my calves to loosen up, despite foam rolling and deep tissue massages every couple of weeks. I figured that I would “overshoot” high and go back up to an 8mm offset to see how it felt for comparison. 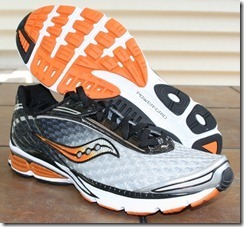 The Ride 6, being otherwise neutral, seemed the right option and being a Saucony fan didn’t hurt. Unfortunately, I could never get the Ride 6 to fit well. The 10 was too big length wise (I wear a 10 in other shoes) and my heel consistently slipped causing abrasions. I tried the 9.5 but it was too tight and even the 9.5W did not help. I had to return the Ride 6’s as a result. 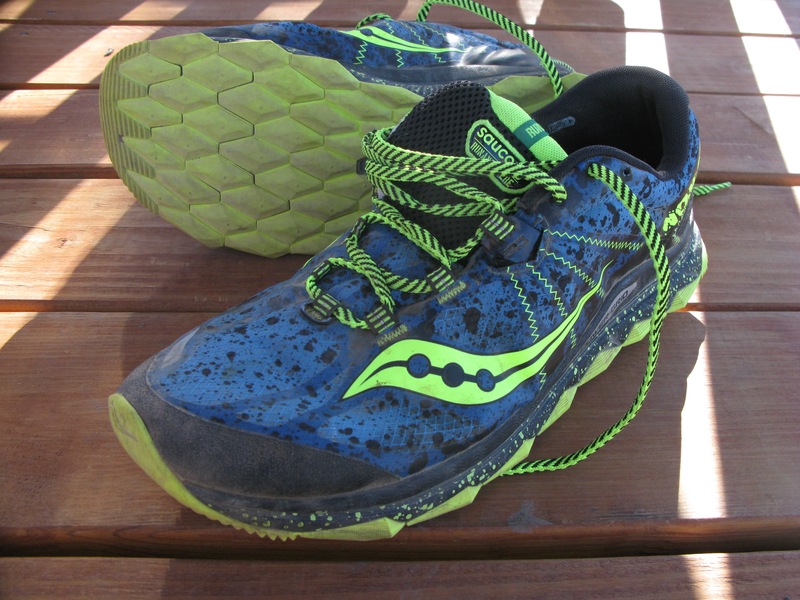 I also noted the numbing feeling in the forefoot with the Rides, something which I have noted in the Kinvara 4 as well and as others have noted in Pete’s Kinvara 4 review here. I did find that this feeling dissipated in time as I wore the shoe in. I was disappointed that the Ride 6 did not fit my feet well, as otherwise it seemed to be a very comfortable shoe with great cushioning. I did note the extra weight, which is an interesting sensation, even for just a couple of ounces over the Kinvara 4. Pete, if you are reading this, someplace, I think in one of your comments to the Kinvara 4 review, you had mentioned the Guide 7. Just wondering if you are running in them and might have a review pending. I’d be curious to get your take on an 8mm shoe that Saucony is claiming does not overtly feel like a stiff guidance/support shoe. Haven’t run in the Guides yet, but have worn them casually a bit and they seem to flare up my PF. Still gonna try to run in them as I’m curious what is going on! Thanks Pete. Look forward to your thoughts. I too am concerned about that possibility, with an arch in the shoe that might be too high/stiff and will cause irritation. I have avoided any type of support/guidance shoe for that reason. Aww, gee, you sure hurt my feelings saying that traditional shoes don’t kill from. Look, I’ve run a couple of miles in a pair of brown leather dress shoes, so I know shoes don’t matter too much. Us minimalist types just like the FEEL of the minimal shoes better, got it? Thanks, Brian. I’ll look into that possibility. It bothers me very little once the shoes are slightly less new, so I don’t really spend a lot of time paying attention to it. Either way, good to know. I had them in both feet, and had the one in my left surgically removed, which was quite a saga and way more trouble than it was worth. The one in my right started acting up just around when I made the switch to minimal shoes. Between Altras, VFFs, and Correct Toes, I haven’t noticed it in months. Long story short – it can easily be managed as long as you don’t aggravate the hell out of it. I was thinking the exact same thing. Tight forefoot fit that lessens with break-in. When I first put on the Adidas adios Boost I though I wasn’t going to be able to wear them because they squeezed my foot, but after a few hours the upper broke in a bit and they felt great. Great review, Tyler! I have been interested in the Rides for a while now, and I think I may just need to pick up a pair when my current “long distance trainers” wear out. As a side note, another great shoe that is in this same ballpark (although with a 10mm drop) is the eternally unchanging Brooks Launch. I am on my 3rd pair now, and almost ready for a 4th. You should check it out sometime, it has a fantastic smooth ride and nice cushioning too. Thanks, Brad! The Launch is a great shoe, and one that deserves a place in most collections. The Ride 6 is slightly heavier than the Launch, but I don’t think that should deter you from giving it a try. Tyler, since originally writing this review, have you had any opportunity to try out the New Balance 890 V4? The reason I am asking is that I am somewhat tossing between trying out the Ride 6 or the 890 V4 for my next long run (or recovery) shoe. Thanks! I have had a chance to try on the 890v4 in stores, but not a chance to do any significant running in them. 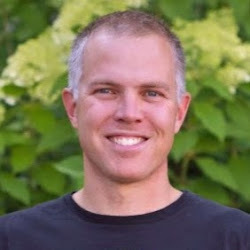 Pete recently published a great review here on Runblogger. The similarities between these shoes is that they are both neutral trainers designed for high mileage without being bricks. 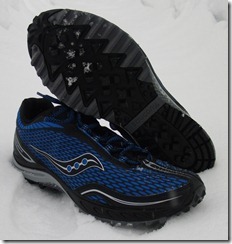 The drop is similar, with the Saucony being 2mm shorter, but this is negligible. The Saucony will seem a bit softer, but also weighs about an ounce heavier. If we looked at this on a spectrum, the 890v4 would lean more toward the race flat end of things, while the Saucony Ride 6 would drift a little further toward the traditional trainer end. Great, thanks for the response and the thoughts, Tyler! Have you been using the Ride a lot during the last 6 weeks since your original review? Do you still like them as a good long distance trainer? I still wear the Ride about once a week. They’re one of the shoes that I find to be very dependable and won’t surprise me. I think that they have gotten more comfortable as I’ve had a chance to break them in further. I once wore them on a technical trail, but wouldn’t recommend them for this use. They had some issues with traction and I felt some of the sharper rocks on the course. I hadn’t really prepared to run this particular trail, but my volunteer duties for a trail race were changed from aid station worker to course tear-down duty (aka run the whole course taking down markers). Overall, I find myself suggesting this shoe for someone looking for a long distance trainer. Let me know if you get a pair and what you think! 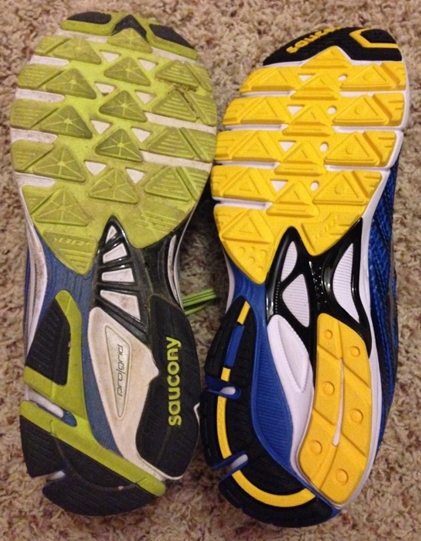 I noticed your photo comparison of the Ride 5 vs Ride 6 outsoles. I’m hoping you can provide some clarity since you have some hands on experience with these shoes. The Ride 5 has “Pro Grid” markings on the shoes, while the Ride 6 has “Power Grid”. There’s also 2 distinct lines for the Ride 5. A. Ride 5 (link to amazon.com) B. ProGrid Ride 5 (link to amazon.com). I’ve been hard-pressed to find a difference in these shoes. I was recommended a Ride 6 at the local running store. I figured I’d step back to the Ride 5 and get last year’s model at a fraction of the cost. Now I’m torn because I want to make sure I get the right shoe for me, but I’m not sure ProGrid is what I need since I’m a neutral runner. I’m hoping you can “clearify” things for me a little. The Ride line is a neutral trainer. No change in that regard between the 5 and the 6 and the two Amazon models are the same shoe, they just labeled them differently. The change from ProGrid to PowerGrid is simply a change in the material used in the midsole. PowerGrid is ostensibly more cushioned, while also being lighter in weight. Depending upon your purchase timeline, you might visit a local running store to try the Ride 6 and see how it fits and feels. Make sure that you can do a test run in them, not just walk in them. If they work for you and you can wait a bit, get the 6 when the price drops in the next few weeks. 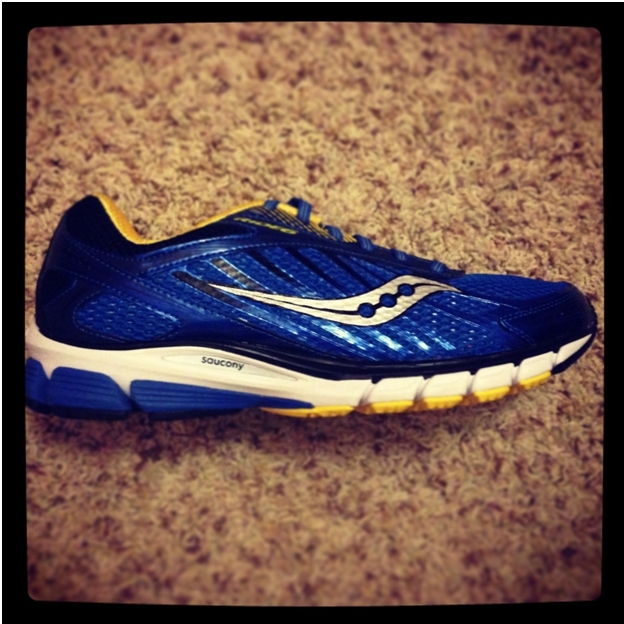 While you are in the store, be sure to try other similar cushioned, neutral shoes for comparison. 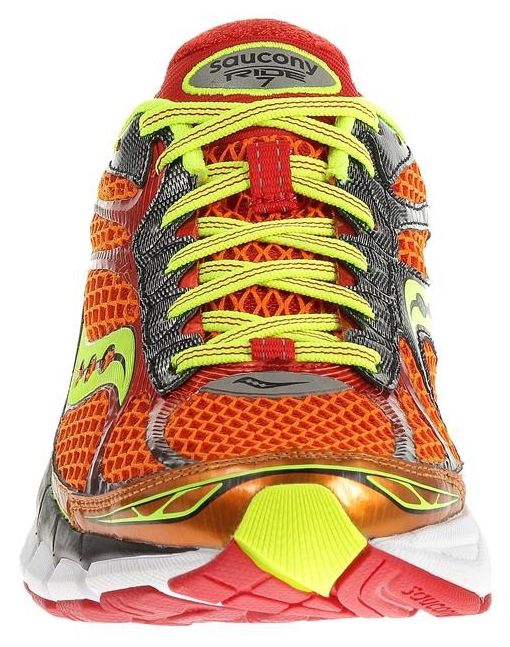 As you may note from my prior comments above, the Ride 6 did not work for me, as it was a bit too narrow, which seems to be an issue for the recent set of Saucony models. So testing them for fit is important. From one Marc to another. Thanks for the response Marc. I think I was “researched out”…too much info in too little time. I was getting the Ride and the Guide lines confused with each other and the Power Grid label threw me off. I did a test run in the Ride 6 in and around the store, which is how I settled on that line. I tried various shoes that were neutral and cushioned and it came down to Ride 6 vs Asics Cumulus 15. I settled on the Ride 6 due to price as the shoes felt the same to me. Then I saw the Ride 5 at only $42 on Amazon, so I snagged them. At $42, they’re disposable vs $100+ for the other 2 in the stores. Thanks to your info about the Ride 7s being out soon, I’ll watch for similar savings on the Ride 6. I’ll gladly run in last year’s shoes for that sort of savings. Thanks again for taking the time to respond to my concerns. As for the Ride 5, I’ve gotten two 3 mile runs in on them so far and they are comfortable. They feel slower than my Asics GT2140s do, but maybe that’ll change after I break them in.